March 22, 2016 – Mitsubishi Heavy Industries, Ltd. (MHI) has received an order for H-IIA launch services from the Mohammed bin Rashid Space Centre (MBRSC), in the United Arab Emirates (UAE), for launch of the Emirates Mars Mission’s (EMM) Hope spacecraft. EMM involves the University of Colorado Boulder as the leading U.S. scientific-academic partner. The EMM Hope mission is being designed to observe weather phenomena like Martian clouds and dust storms as well as changes in temperature, water vapor and other gases throughout the layers of the atmosphere. Leading the mission are more than 75 Emirati engineers and researchers, a number that is expected to grow to more than 150 by 2020. Mike McGrath, LASP engineering director and project lead at CU-Boulder, said that a team comprised of CU-Boulder faculty, LASP engineering and missions operations staff and university students will contribute to the effort.The CU-Boulder part of the mission will be undertaken at the Laboratory for Atmospheric and Space Physics (LASP). 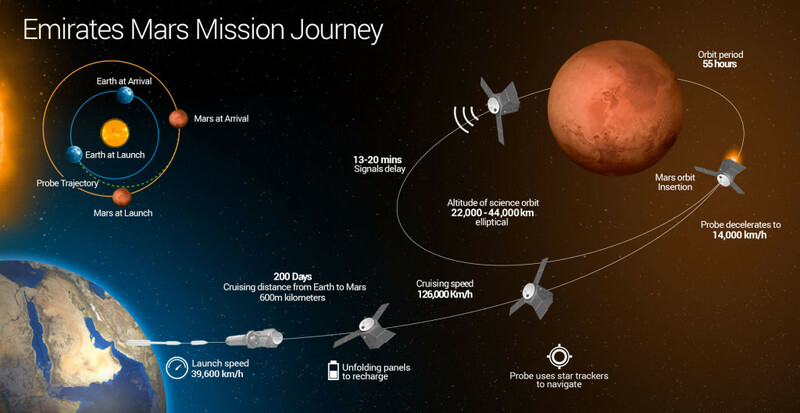 Hope is expected to launch in the summer of 2020 on MHI’s H-IIA launch vehicle, and is set to arrive at Mars in 2021 to coincide with the 50th anniversary of the founding of the UAE. The UAE Space Agency (UAESA) takes administrative and financial responsibility for the EMM, and MBRSC is responsible for leading the design and development of Hope, as well as the execution of all phases of EMM, which includes technical coordination with the H-IIA launch vehicle. This order for the EMM marks MHI’s fourth overseas contract for its launch services. The previous three orders received by MHI from overseas customers involved the 2012 launch of the Korea Multipurpose Satellite-3 (KOMPSAT-3) for the Korea Aerospace Research Institute (KARI), the 2015 launch of the TELSTAR 12 VANTAGE communications and broadcasting satellite for Telesat Canada, and launch of the KhalifaSat for MBRSC, planned in 2018. MBRSC, or the former Emirates Institution for Advanced Science and Technology (EIAST), was newly established by the Dubai Government in 2006. The Space Centre is working to develop the science and technology sectors in the region, which include research and development in satellite manufacturing and systems development, and Earth observation through satellite images. MHI has been playing an important role in Japan’s development of space launch vehicles since a national program was started in Japan in 1975. Following technology transfer from JAXA (Japan Aerospace Exploration Agency), MHI has been placed in charge of all aspects from manufacturing to launching satellites from the H-IIA No.13 (launched in September 2007) and the H-IIB No.4 (launched in August 2013).